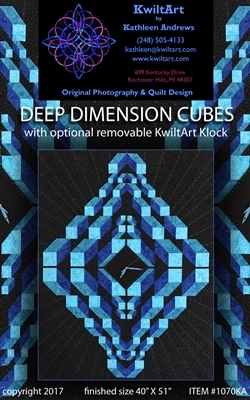 Introducing a new quilt design with the removable KwiltArt Klock. This quilt design creates incredible depth and dimension. This is a very easy quilt made with four patch blocks (one square and three 1/2 square triangles), in five different sizes. The removable KwiltArt Klock is made with fusible foam and Velcro and the battery operated KwiltArt Klock is inserted through a buttonhole in the quilt and the foam. Because the center is removable, you can change it at anytime with a new design (quilt block, embroidery, photos printed on fabric, seasonally, etc.). It's time to make a quilt with a KwiltArt Klock!!!!!!!!!!!!! Confident Beginner Finished Size 40" X 51"